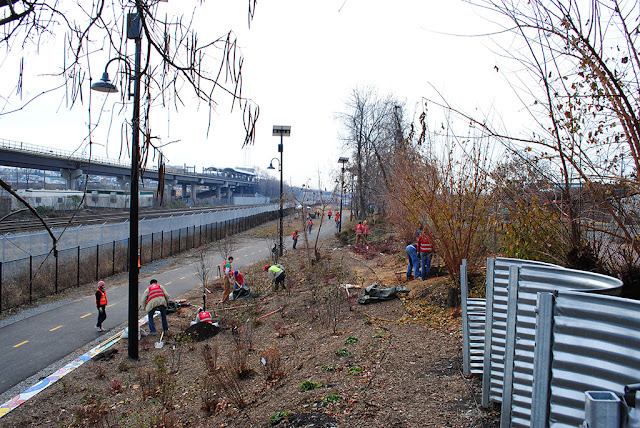 Our planting this weekend at the Metropolitan Branch Trail was our final Community Tree Planting of the year. If you haven't been to the Met Branch Trail yet, it is an eight mile cycling and walking trail that stretches from Union Station to Silver Spring, Maryland, following the old route of a historic B&O Railroad line. It is a fantastic urban connector path that passes through some great neighborhoods in Northeast DC including our new Brookland home. We planted trees along the off-road section of the trail near the Rhode Island Avenue Metro station, where the trail follows the Red Line Metro and existing heavy rail tracks. 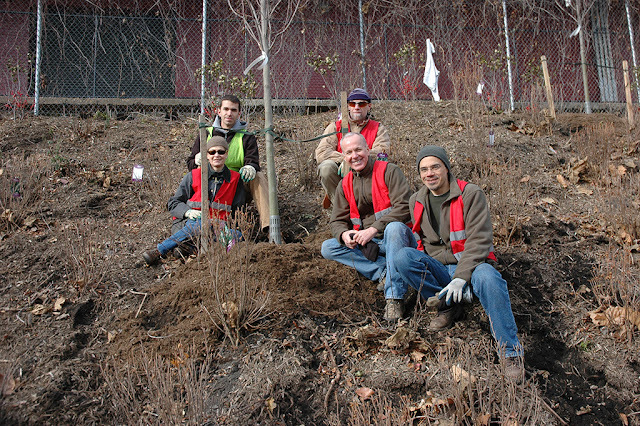 Volunteers planting trees alongside the trail. The planting was attended by 31 Citizen Foresters, 13 Casey Trees staff members and 16 volunteers from Rails-to-Trails Conservancy and Gospel Rescue Ministries. We planted 29 trees: Cherokee sweetgum, Kentucky yellowwood, Eastern Redbud, paperbark maple, crape myrtle, golden raintree and saucer magnolia. The CTP was sponsored by Rails-to-Trails Conservancy, with grant funding from the Coca-Cola Foundation. We'd also like to thank our Citizen Foresters who came out to help us this weekend and supported our planting efforts throughout 2010. Keep an eye out for our Spring 2011 planting schedule in January. We'll have even more opportunities to volunteer than even this past Fall season.